The first Observatory open day of 2019 on Sunday 17th March attracted upwards of 150 visitors. This allowed seasonal changes during the Earth’s orbit around the Sun to be explained, starting with the spring equinox. At our January meeting we notified members that Sefton MBC had invited us to accept a management licence, convertible to a lease after 2 years, to manage the Victorian observatory in Hesketh Park on their behalf, and we are pleased to announce this has now been approved. The next stage is for Sefton’s Estates Department to prepare the licence. We are pleased to announce that Mike Dow, one of our longstanding members who also maintains and repairs the mid Victorian telescope in the Hesketh Park Observatory, has been elected as a Fellow of the Royal Astronomical Society. His sponsor was Professor Ian Robson, who referred to both his and Southport AS’s support of the Cooke telescope in the Observatory. We must thank Pam our Membership secretary, and Bob, our Observatory manager, for a very welcome Christmas present this year. Pam was contacted with the offer of a virtually unused large Celestron telescope by an ex Headmaster who lived in Parbold. Pam collected this (heavy) telescope and brought it back to Southport, and Bob who examined it, decided it was better to sell it as it needed some specialist repair work. Subsequently it was sold for £600, which has been deposited in our bank account. Members of the observatory sub group attended an evening meeting for community voluntary groups at St Luke’s Church, Crosby, organised by Sefton Green Spaces. The Society was pleased and honoured to receive an award recognising our specialist work maintaining and repairing the Victorian telescope in the Hesketh Park observatory. During November the Observatory Management subgroup opened the observatory between 10.00 am and midday, to address several routine maintenance tasks related to the telescope and dome. This will continue during the winter months, and will include ad hoc opening during the darker evenings whenever skies are clear, and whenever the Moon and Planets are well placed for viewing. This enables members to view them together with some of the brighter deep sky objects like M 31 (Andromeda galaxy) and M 42 (Orion nebula), using their own telescopes and/or society telescopes, as well as through the 1869 six inch Cooke telescope. During the summer, Southport AS supported events and open day’s arranged by Hesketh Park’s “Park Force Volunteers” on behalf of Sefton MBC. This group of volunteers has Public Liability Insurance (PLI) cover provided by Sefton’s own scheme for the various activities they undertake supporting the Park. We are pleased to announce that Professor Michael Bode BSc (Hons), PhD, FRAS, CPhys, FinstP has accepted our invitation to become President of the Society. Currently he’s Special Representative of the European Astronomical Society to the EU in Brussels. He retired in 2015 as Professor of Astrophysics at Liverpool John Moore’s University where he was the founding Director of the LJMU Astrophysics Research Institute. His research work focused on furthering our understanding of exploding stars, and he’s held both Advanced and Senior Fellowships of the UK Research Councils. He has published over 240 papers in the top peer reviewed international journals in astronomy, including 14 Nature Letters, and edited 5 books. He has given many public talks on his areas of expertise and appeared regularly on BBC TV’s ‘Sky at Night’. 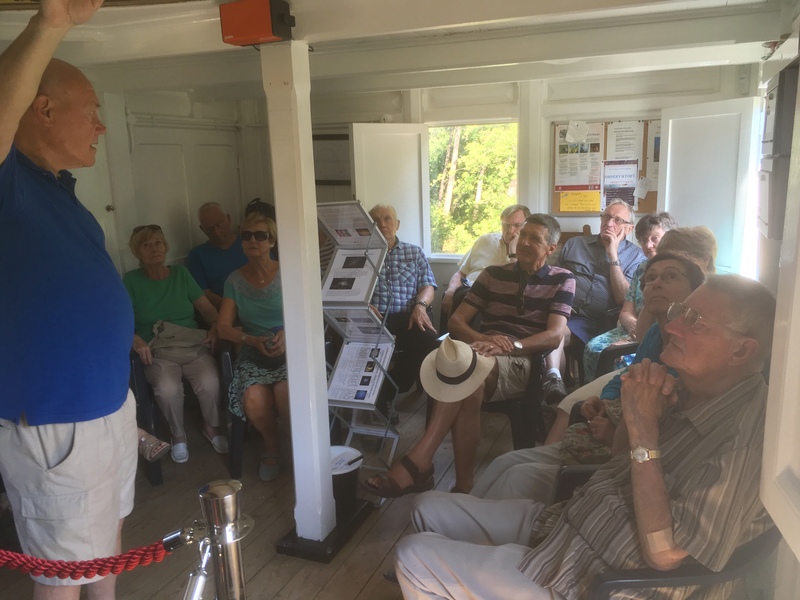 Members of the Links Rotary club of Southport visited the observatory during the evening on September 12th, and members of the Formby U3A Science Group visited it on Wednesday 4th July. The U3A group enjoyed the occasion as the two photos show, helped by a warm sunny day. Patrick who manages our Outreach activities organised the preparation and printing of four educational astronomy leaflets about the Sun, Moon, Solar System’s Planets, and Milky Way. These were funded by a community grant of £250 provided by Seqirus, the company Andy Cowan works for. These information sheets are suitable for schoolchildren and adults with little or no knowledge about these celestial objects. Regrettably on the night of April 9th 2018, thieves broke into the ground floor section and stole two small telescopes belonging to FOHG, causing damage to one of the two new custom made doors. Bob Mount set up the Southport U3A Astronomy Group and become its group leader. Any SAS member wanting further details should speak to Bob at one of our meetings. Website visitors can go to our external links page for details. 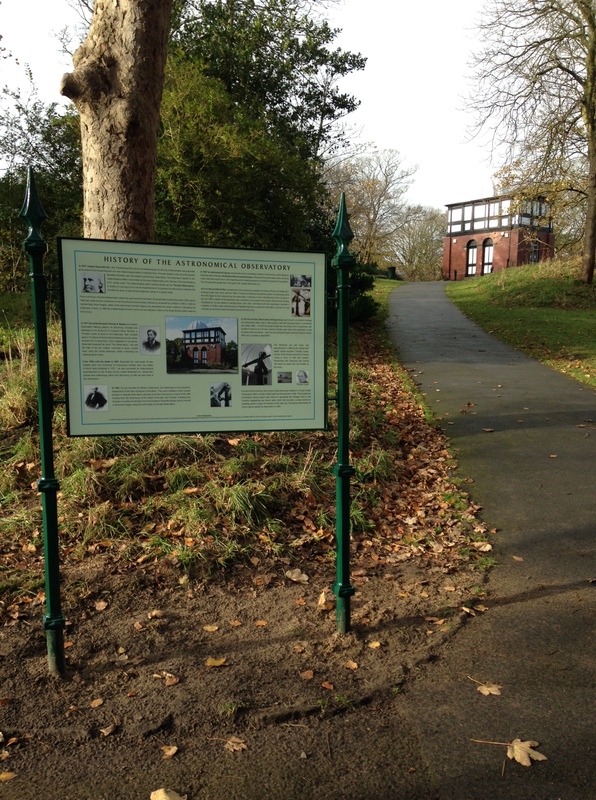 Following the award of our 2016 Skipton Building Society Grassroots grant, the information panel has now been installed near the observatory in Hesketh Park. The Society for the History of Astronomy included this photo and a short write up about the information panel, and the history of the observatory in their spring 2018 e-newsletter. On p 9 they printed a readable image of the information panel. 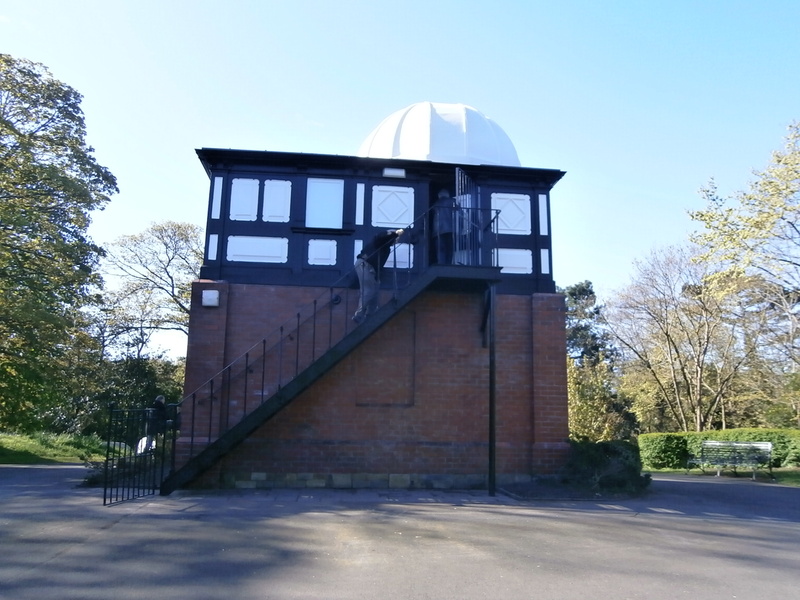 Sefton MBC asked the Society to submit their proposals on how we could develop the educational and tourism potential of the Hesketh Park observatory, which have been submitted. Given our long term partnership with Sefton and astronomical knowledge and expertise, they accept we are best placed to maximise the educational value and interest this subject has to offer. The FAS has notified its members they will produce legally vetted “generic” documents to ensure societies can conduct their activities, including educational outreach, in a competent, legally compliant, and professional way. These documents can be customised to suit local circumstances and the SAS committee has agreed to base their documentation on them. To improve our focus on using the Cooke telescope for observing and educational outreach, we have increased our management committee to include Bob Mount as Observatory manager, and Patrick Kiernan to develop Publicity and Outreach. Further, an Observatory sub-group chaired by Bob has been re-established, and includes Mike Dow, Ray Bennion and Patrick Kiernan, plus other SAS members as and when needed. This sub group will be responsible for ensuring only those individuals who have undergone training to use the telescope effectively without causing damage, can be approved to use it; a requirement Sefton MBC have stipulated. The sub-group will also be responsible for developing an observing programme and recommending specialised purchases that enhance the observing capabilities of the Cooke telescope. Overall, this will ensure the educational value of the observatory can be fully utilised for the benefit of today’s Park visitors, including local school children and other groups, which was a key requirement of Joseph Baxendell Jnr. when he donated the observatory to the former Southport Corporation in 1901. On Wednesday 26th April 2017 the refurbished observatory was handed back to Sefton MBC by the contractor Maysand. These photographs confirm the observatory is probably now in the best condition since first installed in Hesketh Park in 1901. For more information about the history of the observatory visit our Joseph Baxendell & his observatory page, and for information on buying and using telescopes visit our Introduction to astronomy page.